With this text we celebrate our small, internal jubilee. In fact, this is the 50th bulletin on the site that describes our competitions. We returned home from fighting in the first round of the Hungarian Championship with two wins and one defeat. 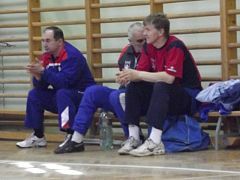 In the first game we beat the host of Szeged, and afterwards the women's national team of Hungary. The defeat we suffered from Piremon. You may watch this match on our Video Gallery. It is true that we have a problem with the hall in which we train and where usually we play our games. We are on the way to solve this problem as best we can. In that sense, this competition day could be completed otherwise, but this time here is really nothing great to tell. 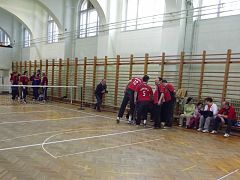 That was a normal competition day in which neither our, nor other achieved results were not surprising, except, perhaps, very good play of host team, especially in the game against Piremon. Thus, we direct reader's attention to greet and praise all the efforts to organize the Magyar női válogatott (Hungary Women representation), it is the "The red squad" in the subtitle, although here they wear green T shirts. We refer to these and all the other ladies greetings for occasion of the 8th of March. It's never too late, it's still March. 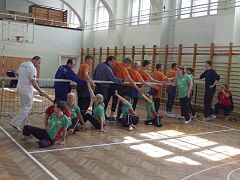 As we mentioned on the first page of this website, the story of sitting volleyball is a sport, but it is even more the life one. This team's story is certainly much longer and more complicated than the amount here, but for now I will transfer just as much as we learned in a short chat with a man who was the father of the idea, so the story started and was realized. I have already mentioned Mr. Mihaly András as the webmaster of the ECVD site, and you can recognize him by the striped shirt in the picture from Zanka. Organizing team began in the year of 2009, somehow after the Paralympics in Beijing in 2008. The idea was good, but how many effort was needed to carry out the work - only he can tell. The fact that ladies are much more difficult to organize than men is saying a lot about it. In addition, the age of the ladies is as is and it is not decent to talk about - but you can evaluate it on your own from the following photos! As you can see, they are generally amputeers, but strictly women with disabilities. I will put some spice here by saying that half of them travel travels to trainings 100km and even more, and trainings are three times a week. As things are from few weeks ago, the new coach will spend a lot of time on the road, too. Then, as the cream on the cake, comes the fact that literally one of them had a previous experiences with the ball and the sport in general! As the strawberry on a whipped cream is something you already know - they compete with men, where the ball flies much faster and where the height is adjusted to men. The truth is that there are only 8 or 10 women's national teams in Europe, but this year the Piros csapat will participate in the European Championship in Poland. This year of 2013, has the special significance for them, because they made their first sporting victory! You can learn more about it here, if you know some of Hungarian language. Congratulations to the ladies and to everybody who are fighting for and with them. Now AGAIN followed AMENDMENTS to the competition "Ülőröplabda Magyar Bajnokság" with the idea of improving the quality and quantity of games. Anyway we are not complaining, as long as we can coordinate schedules with our other obligations. 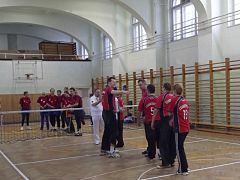 The first, the spring part of the games "Round Robin" in 5 rounds, ie cities. The first round has just been played, and the next part of the next half-season rounds from 2 to 5 (at the end of the text). In the second, autumn part will be played by games according the achieved rankings in groups A (from 1st to 4th place) "Round Robin" twice, and the same in the group B (from the 5th to 8th place). The third part of the playoffs: 1-8, 2-7, 3-6, and 4-5, winners will play in semi finals, and the defeated will play matches for the placement for the 5th place in the same way. The following are the final game and maches for final placements.